See those rolling green hills of tea fields in the photo above? That gorgeous sight will be on our daily drive to the office this fall!! It's beautiful, right?! Aaron & I will be packing our bags (lots of them) and moving to Nairobi, Kenya this coming September! We're feeling quite a range of emotions about this big move halfway around the world, but mostly we're excited to see what God has in store for us there! I'm going to fill you in on exactly what we'll be doing, who we'll be working for and all the other fun details including how YOU can be involved, but to fully appreciate all of that, I think a little bit of the backstory is needed first. Aaron & I met back in high school. We both took our first trip to Africa in 2009. We went to Zimbabwe with Aaron's mom to visit a children's home and meet many of the friends that she's made there during her almost annual trip for over 10 years now. Aaron hadn't even professed belief in Jesus at this time, but the Lord was already working in both of our hearts to develop a love for missions and other people groups. We went back together again with Aaron's mom for another visit to Zimbabwe in 2010. At this point, we were both in college, and I ended up spending my next two summers in Kenya. During the school year, I was also taking Swahili for my foreign language credits at Duke. Fun fact: Swahili is the national language of Kenya and is one of the most widely spoken African languages. I also took a class called "AIDS & Other Emerging Diseases" taught by a biology professor that was heavily focused on the research she'd done through her Kenyan NGO. This class was seemingly a "random" choice for me at the time, but if you keep reading a bit further, you'll understand why this very specific class really wasn't random at all. P.S. You're welcome for these photos of us when we were just babies!!! The photos above are from our first trip to Zimbabwe in 2009! With our shared passion to take God at His Word and heed the call to go where He takes us, we began to explore different options. We were knee deep in a missionary application process when we decided to reach out to the organization, CARE for AIDS. However, this wasn't the first time we were communicating with them. Back in college, during one of my summers in Kenya, my team just "happened" to spend an entire day at a CARE for AIDS center just outside of Nairobi. I was so impacted by what they were doing, that I came home many weeks later still talking about that day. Around the same time, Aaron had joined a club at Furman led by one of his close friends, Sarah. Any guesses as to what that club was? You guessed it. CARE for AIDS had university student organizations helping to raise funds and awareness for the work they were doing in Kenya. So, long before either of us were considering moving overseas, God put this organization on our radar in really unique ways. We are so grateful that God has now led us to move to Kenya in September to work with CARE for AIDS. To give you a very brief overview, CARE for AIDS seeks to minister, both physically and spiritually, to families affected by HIV/AIDS. We love that this is accomplished through partnering with and empowering local churches, called CFA Centers, to serve those in their areas of influence. CARE for AIDS is approaching the orphan crisis differently, by intervening in the lives of HIV+ parents. 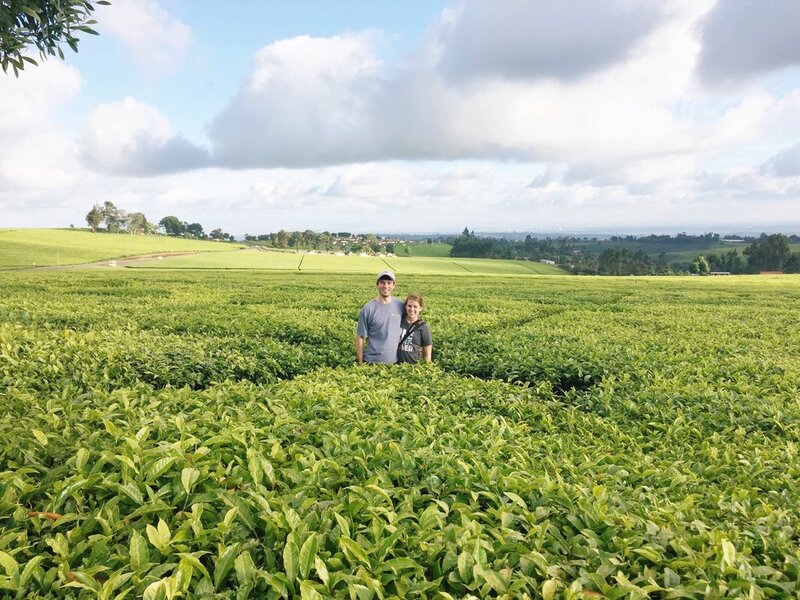 Aaron and I will be joining over 100 of CFA's Kenyan employees to serve and love those with HIV/AIDS in hopes that through the CFA program, they are enabled to live long enough to raise and educate their children and come to know the hope and joy that is only found in Jesus. I'll leave you with that little teaser of information until my next post where I'll unpack in much greater detail what CARE for AIDS does and how we're going to be a part of it in Kenya. In the meantime, if you want to learn more about how you can be a part of our support team, we'd love to talk with you! Send us a message through the contact page, or shoot us an email to casey@careforaids.org or aaron@careforaids.org. And if you just can't wait for that next post, you can also check out the amazing CARE for AIDS website to get a head start in finding out more information about CFA!